EverSaw 8.0 will stay sharp and resist wear, extending its lifespan and, hopefully, yours in an emergency, such as a zombie apocalypse. If you don’t already have an EverSaw when a zombie outbreak occurs, be on the lookout for one when searching abandoned buildings and vehicles. It may just save your life! 1) WEAPONRY — The trusty EverSaw 8.0 can be used as a hand-to-hand combat weapon and is especially effective at piercing the eye socket into the brain to instantly kill zombies. When possible, we recommend weapons with longer reach against zombies. The EverSaw also works well attached to a shotgun or rifle for an improvised bayonet. It’s a great compact backup weapon to keep in your pocket always. 2) FIRST AID — In the event of being bitten by a zombie, immediate emergency amputation of limbs may prevent infection and save your life. This may also be necessary to free yourself if you get stuck with an arm or leg pinned by something immovable in a hostile environment. The EverSaw 8.0 is sharp enough to cut through muscle and bone. (If you try this, we recommend some whiskey and biting down on a fresh cut small branch.) The EverSaw is also handy for sawing through zombie arms when they just won’t let go of you even after you’ve slammed a door on them. 3) TOOL PRODUCTION — Your EverSaw is great for cutting wood to make long tool handles, spears, bows and arrows, bludgeons/clubs, sledges/stretchers, axles and wood rounds for wheels, carving out cooking utensils like spoons, bowls, and ladles, for cutting vines and fibrous plants to make rope, string for bows, fishing nets and traps, etc. 4) TRANSPORTATION — Your EverSaw can be used in a pinch to replace wheels or axles, and to construct rafts or light boats for water travel. Sledges and stretchers can be used for moving the wounded or to move big game when hunting for food. Cutting fallen tree limbs and other obstacles from paths and roadways may also be necessary while traveling in a vehicle. It may also be necessary to widen a narrow path that has been blocked with rubble inside buildings or narrow alleys. 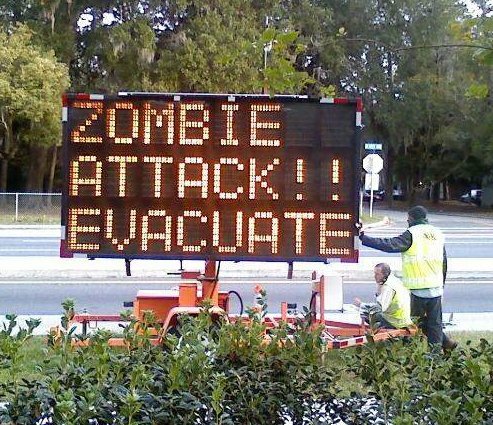 Beware of the sawing noise which might attract zombies! 5) FOOD — The EverSaw is a great weapon on its own and for making other weapons to fight zombies (see #1). Weapons and traps will also be necessary for hunting food and catching fish. Gardens will require fencing to prevent your vegetables from being eaten by animals or other surprise guests. Some foods can be dried and smoked to preserve for future use. You will need to make a lattice of flexible branches to hold your food securely and high enough over the fire to smoke or dry it. Of course, an EverSaw is perfect for the job. 6) FIRE — The EverSaw 8.0 is handy for cutting wood to size for making fires (and to construct a wall to reflect heat in extreme cold locations). In persistently wet conditions, if you do not have fire starting materials you may need to devise a bow and string to get enough friction to start a fire with wet materials. Alternatively, you could also cut the wet portions of thick wood away to expose dry, seasoned wood to burn. Dry sawdust is also excellent for fire-starting! 7) WATER — Water will need to be purified for safety. Drinking unsafe water can lead to icky health problems that can further dehydrate you. Never risk drinking untreated water if you have time to purify it. When the water purification pills run out, the best way to do this is by boiling water over a fire (see #6). 8) FORTIFIED HOME BASE — Getting out of populated areas is crucial to surviving the initial days or weeks of a zombie outbreak. After that, it is best to settle down somewhere isolated. Protecting your home is of utmost importance. A perimeter can be established by making a fence or wall. Any durable materials will do. 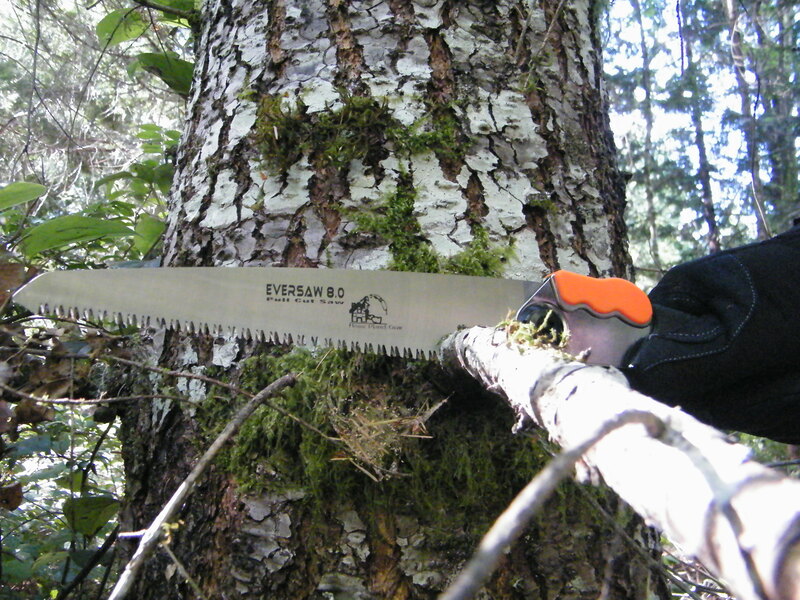 Your EverSaw can cut through wood, plastic, fiberglass, and bone. If material is available, ladders or watch towers are worth building to increase your sight range or to defend your home base from above. Pit traps and spring traps are great for incapacitating zombies around your home, but adding spikes or pointed stakes to the traps can hold the zombies in place longer than without. 9) REBUILDING SOCIETY — When the zombie epidemic gradually fades into history, it will be time to rebuild society. If the cities remain uninhabitable due to safety reasons or because there is little left to salvage, you’ll want to rebuild communities in the more wild areas of the world. Those who have power tools, generators, and who still have fuel will be in luck. Everyone else will want an EverSaw 8.0. 10) LOOKING OUT FOR FUTURE GENERATIONS — It’s important to protect and foster future generations. Getting an Eversaw 8.0 for everyone in your family – especially children – is important so they can always carry it with them, learn how to use it in many different situations in order to be prepared when the zombie apocalypse happens and for after when it’s time to rebuild. Get Your EverSaw 8.0 and survive! 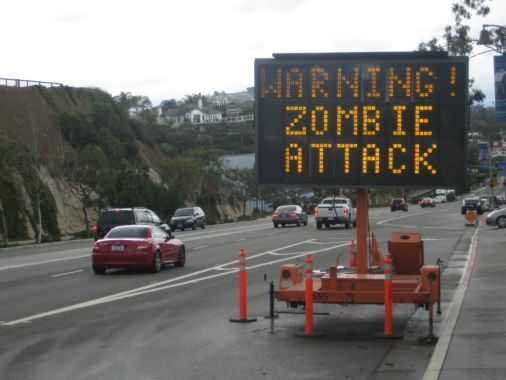 Our sources tell us Halloween is a good time to expect a zombie apocalypse! We at Home Planet Gear want to ensure that everyone is prepared and can do everything possible to survive. Right now, we’re offering a 15% discount to those who don’t yet have their EverSaw 8.0! Or for those who want to get some for their loved ones. This special is on now through The Day of the Dead – Nov 1st!